The sewing retreat ended around noon today. People who live closer to the west coast have already departed the city. I couldn’t make connections all the way to the Canadian east coast work so I don’t leave till 8:10 tomorrow morning. Had lunch with another gal who has to spend the night here, then we went fabric shopping. Linda wanted to purchase some, I was happy to tag along. Britex does have some lovely if expensive fabric. A week ago I saw this silk panel that reminded me of the paintings of Gustav Klimpt – the colors and detail are simply gorgeous. Each 60″x60″ panel was priced at $125. I thought it stunning but couldn’t think what I’d make with it – my present life style is more LandsEnd than Tiffany. So I walked away. I was hoping when I returned today it might have sold – nope, it was still there. 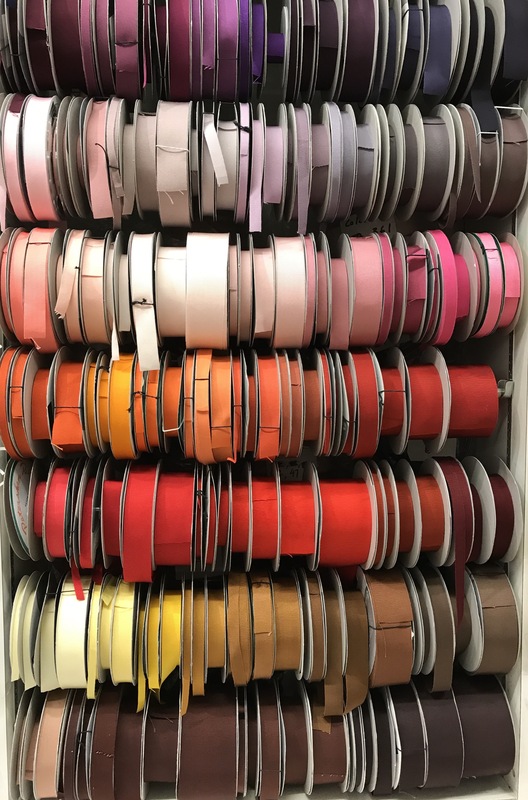 Again, I looked at it but in the end I walked away – I had no idea what I would want to add to my wardrobe. I stopped on the third floor to look at the petersham (a softer, more pliable version of grosgrain). 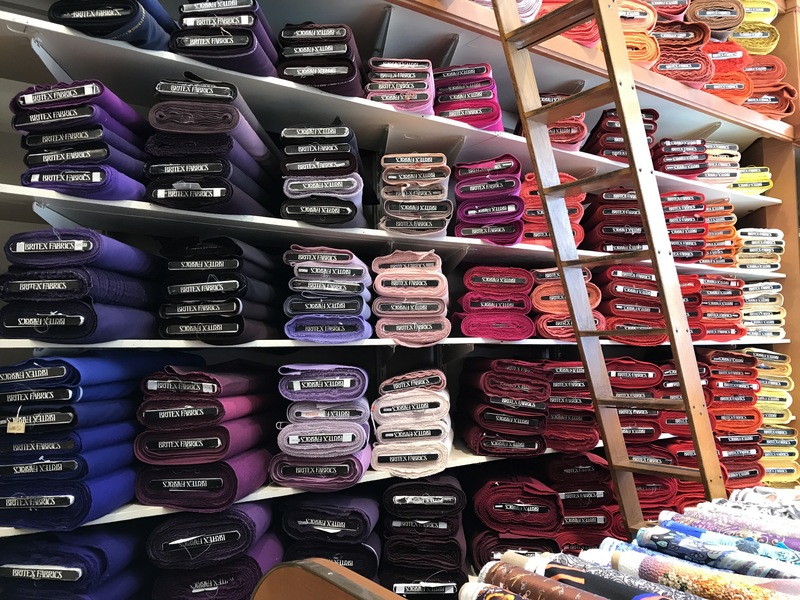 I was expecting a few colours – I thought I’d pick up a yard of a couple – forget that! The adjacent shelves held rows of shades from white through grey and beige to black. 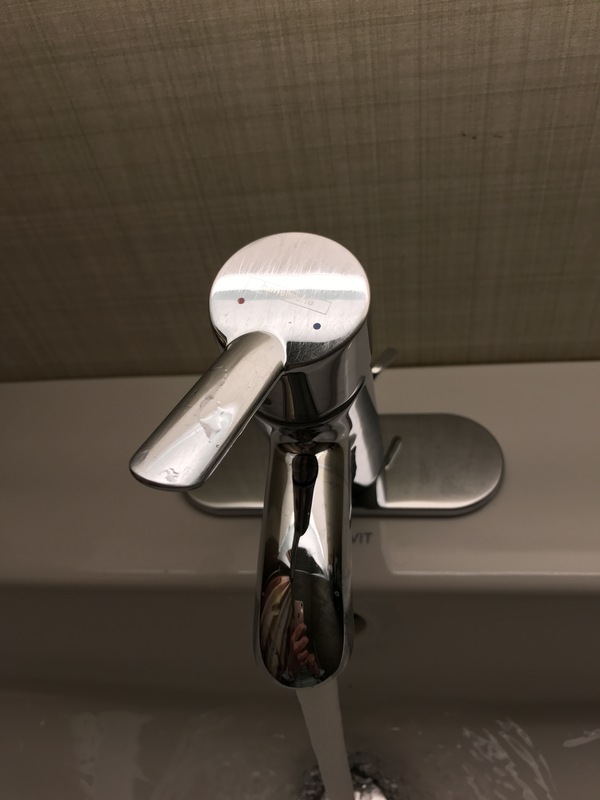 With no specific project in mind it was impossible to choose any. I left Britex empty handed this time which is just as well since there is no room in my suitcase for one more item. 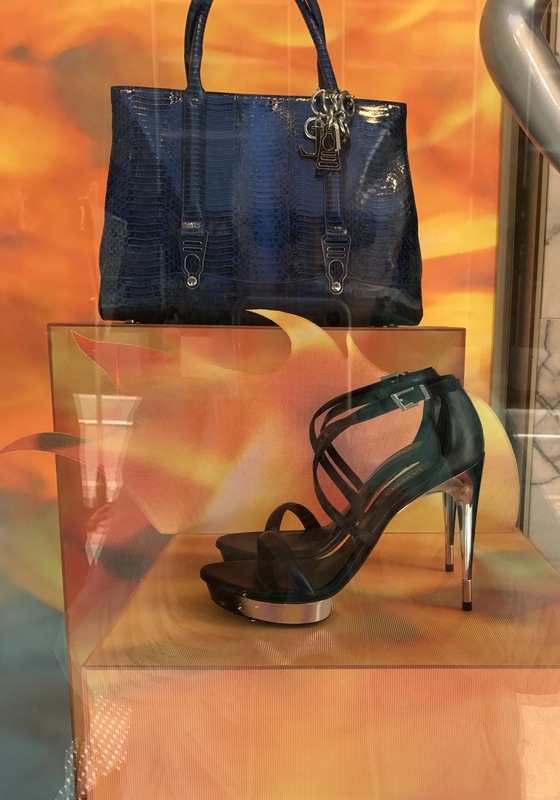 I love this window display. It caught my attention two years ago. It’s still there. It’s a clothing store next door to Britex. 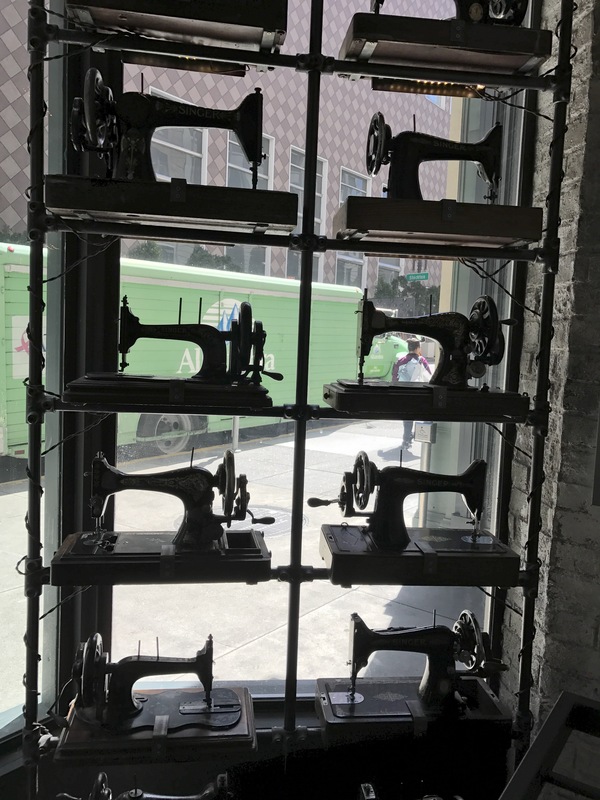 There are garments in a window further along but three of the windows are filled floor to ceiling with these antique machines. Wonder where they’ve found so many. The Apple Store is wide open to the street on this sunny afternoon. 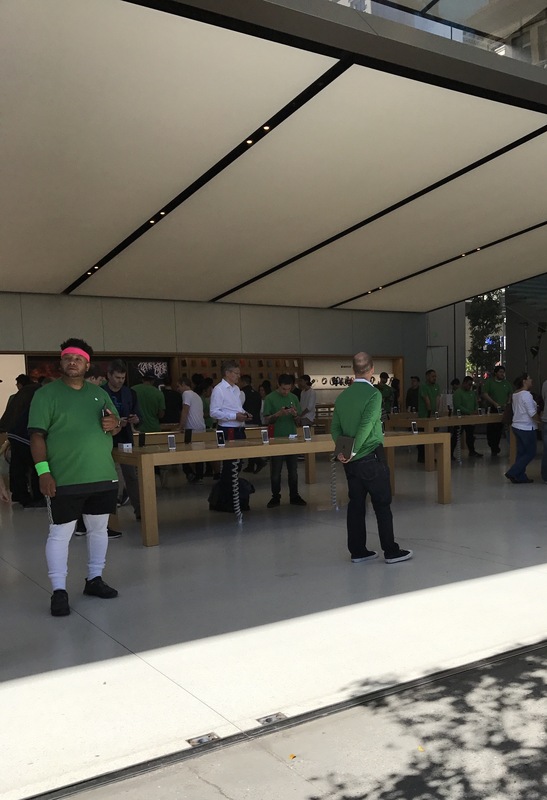 The Apple people in their green jerseys are just waiting there to help you. I had no questions or concerns today so we walked on by. I wonder whether there are any other Apple stores so easily accessible. 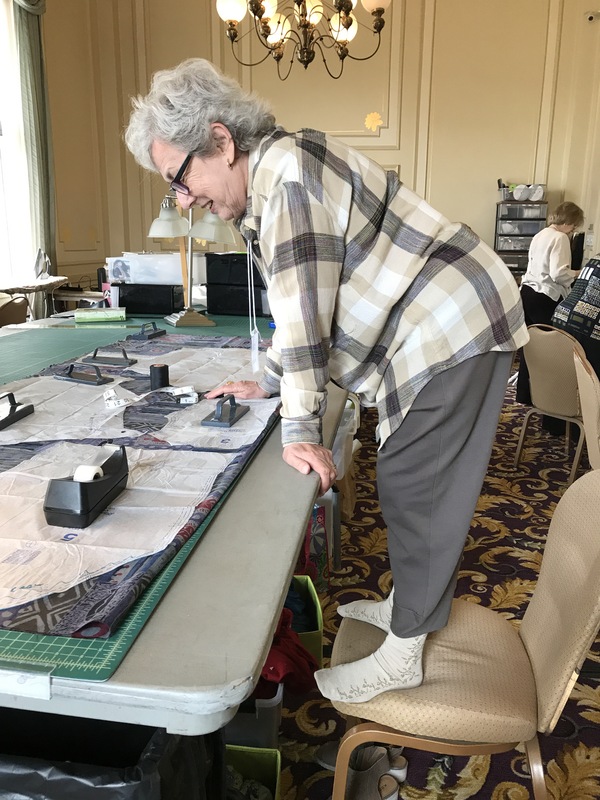 I have had a great week, the women were all experienced sewers, all were deeply involved in learning more about fitting and sewing technique. 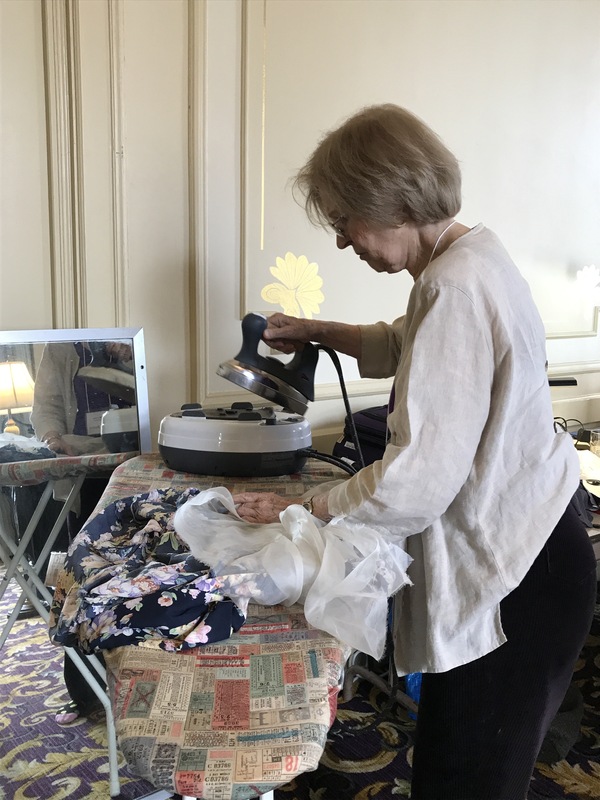 Sandra Betzina is a whiz at fitting. 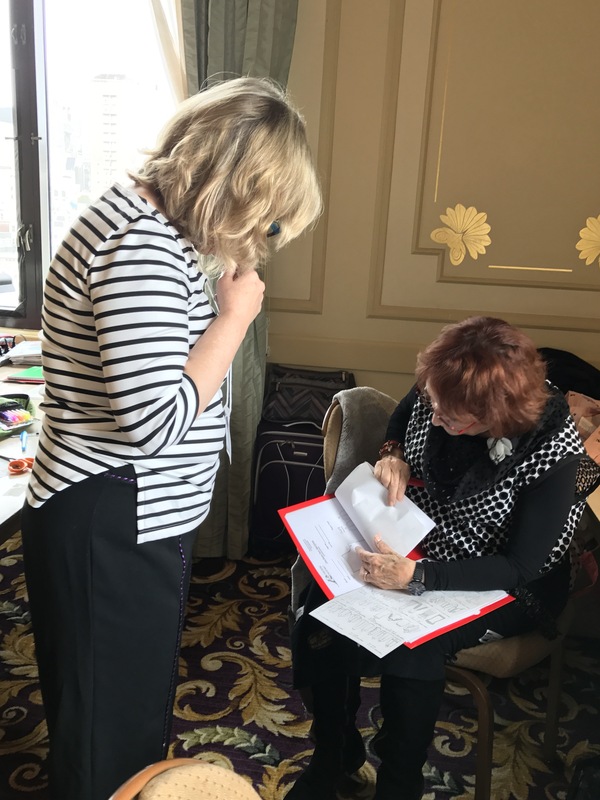 I followed her most of the morning just watching as she spotted adjustments that people could make to their garment muslins then grab a pen and make the corresponding changes to the paper patterns – 3/8″ here, 1/2″ there, opening it out, taking it in. Several modifications to each pattern. At this point in the week those muslins were fitting pretty well. An early night tonight. I have to be ready for the Airport Shuttle which is picking me up at 5:45 in the morning. I haven’t looked at Halifax weather all week. Hope it’s not snowing when I get back! Time disappears when you’re deeply engaged in something. Here it is 5:15pm Thursday afternoon. Where have the last two days gone? 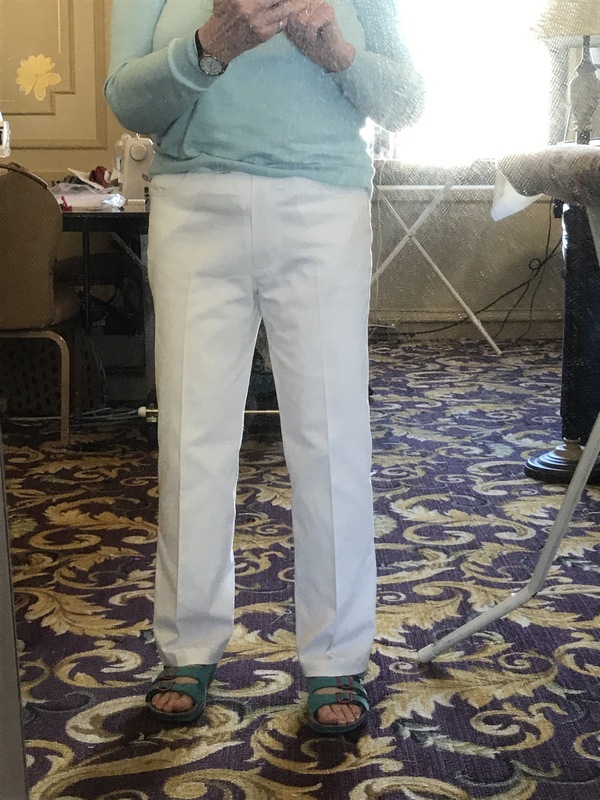 I’ve finished a second pair of pants – you ask about the first? I finished those yesterday morning. Sandra suggested a small modification to the front of the pants so instead of starting on the shirt (I’ve made adjustments to refine the fit of that pattern as well) I thought I should do the second pair of pants to see how they’d turn out. This is the closest I’ve come to a comfortable well fitting pair of pants. The twill I’ve made these in has a wee bit of give but it’s pretty stiff so some pull lines are inevitable. But in a more stretchy or drapey fabric they’ll be great. 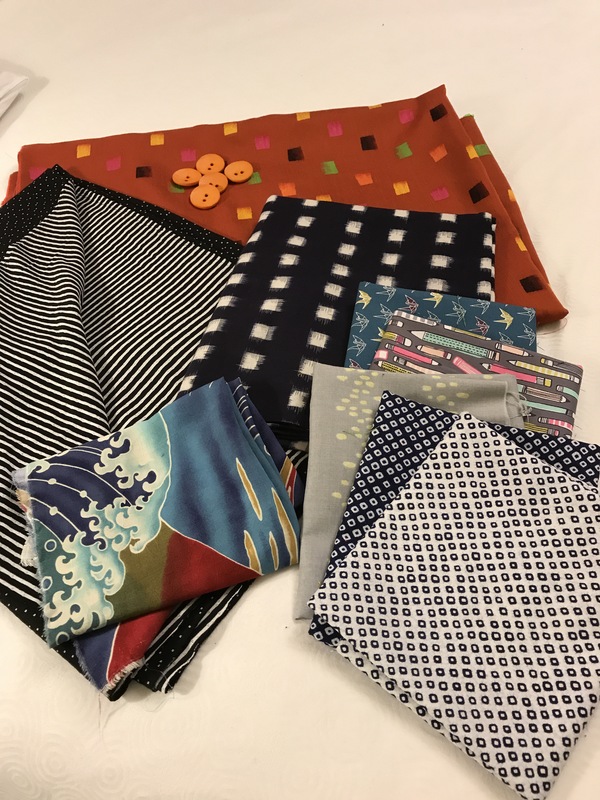 And yesterday (that was Wednesday) we sewed in the morning and went fabric shopping in the afternoon – visited a couple of great fabric shops where I couldn’t resist picking up fabrics for garments as well as a few small pieces of quilting cotton. 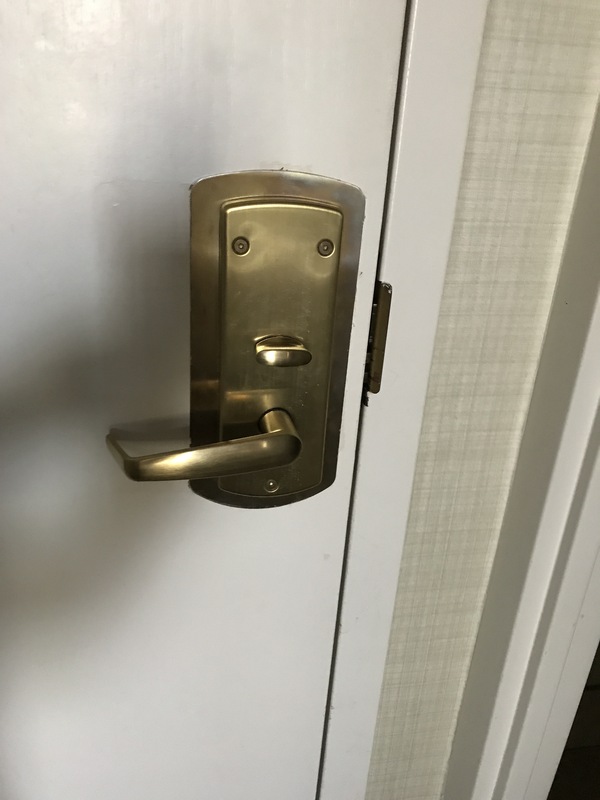 Wouldn’t you call that a sad face? Anyway, I tidied up my sewing station after I finished my white pants. Tomorrow I’ll have time to cut out my shirt before we have to pack up and vacate the sewing room. 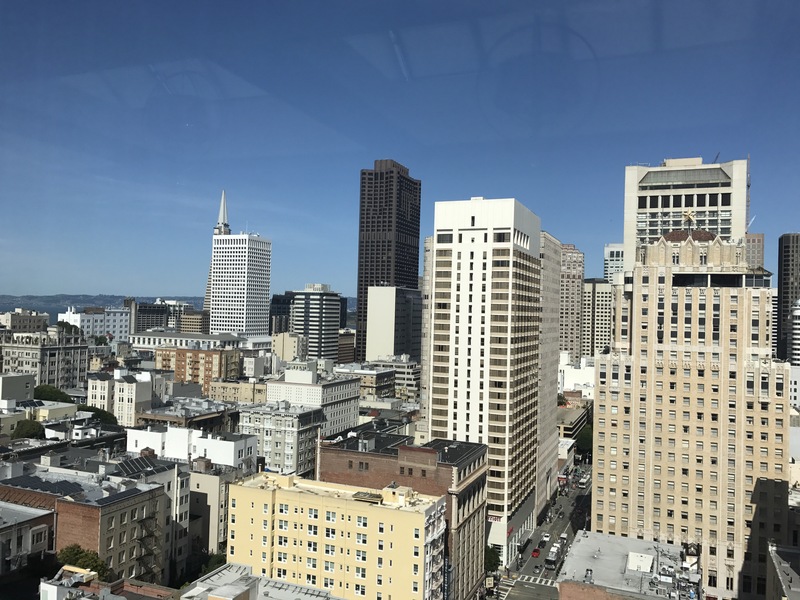 I’m here in San Francisco till very early Saturday morning so I’ll schmooze a bit Friday afternoon. The week has flown by astonishingly fast. We hit the pavement running! It started last evening at 7:00 with our setting up – by the end of the evening everybody had a project underway. This morning the cutting, pressing, sewing began in earnest. 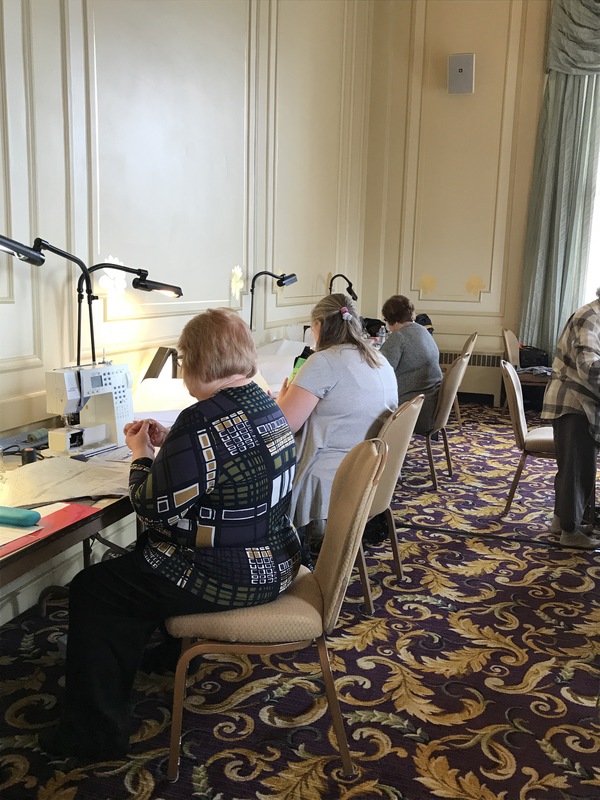 The Power Sewing Retreat with Sandra Betzina is all about fitting and each and every one of the ten women here has significant garment fitting issues. To learn to rectify them, we’re slashing patterns and rebuilding them, so that once cut out and stitched, whatever garment someone is making will hang correctly, not be too roomy (unless that’s the style of the garment), flattering. 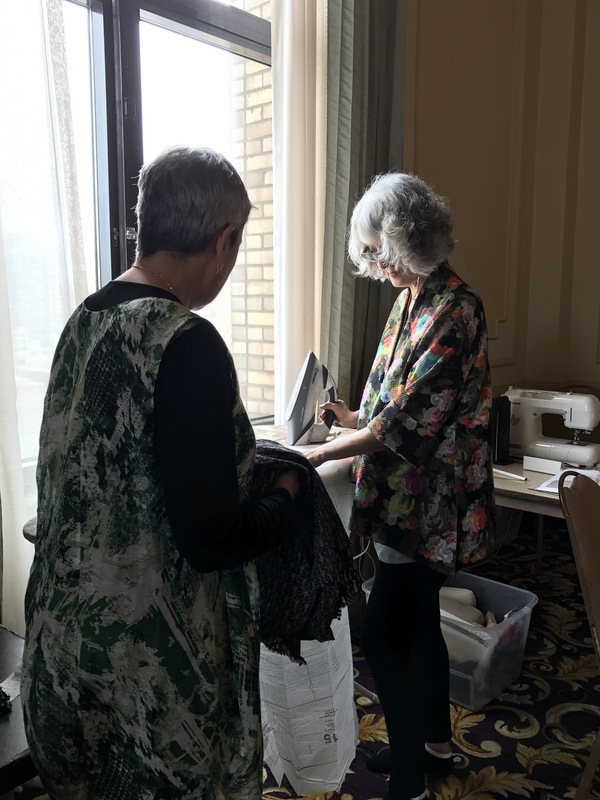 Sandra has a lifetime of experience designing for Vogue Patterns, and she’s been showing women how to create well fitting garments for a very long time. Lots can be learned from watching how she works both with a pattern and garments in progress. 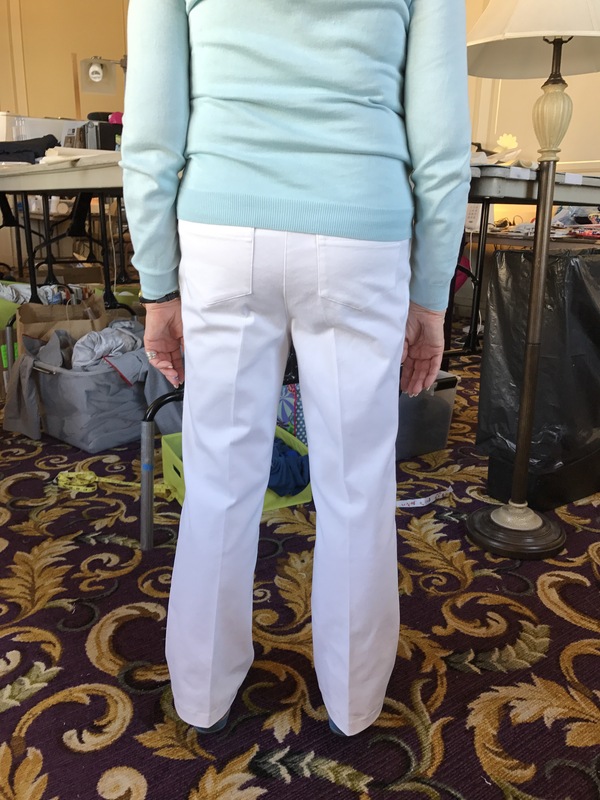 I’m working on pants yet again – Sandra suggested I drop the front waist an inch below the test pair I made before coming which would allow the pants front to hang a bit better from my waist. 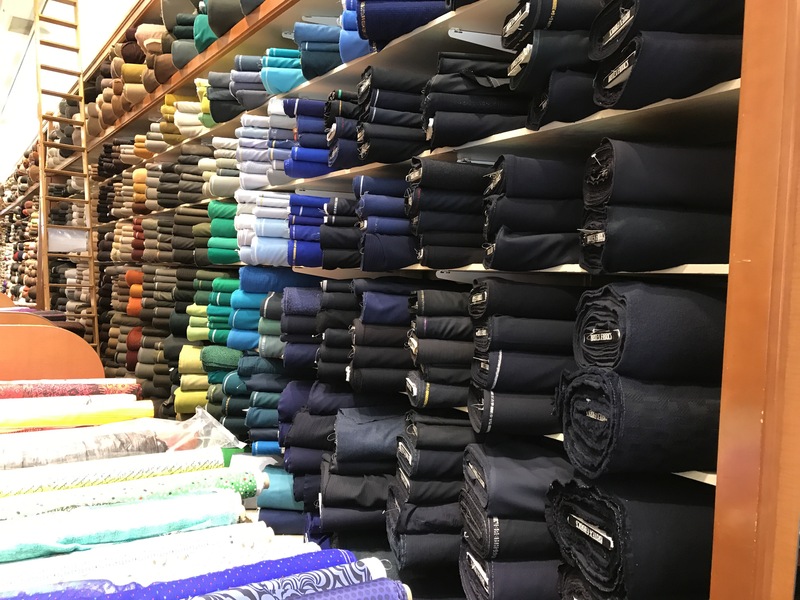 Tomorrow afternoon we’re going fabric shopping. I really must restrain myself because my suitcases were full when I came – not much room for new fabric and notions. I am, though, looking forward to seeing what’s available. 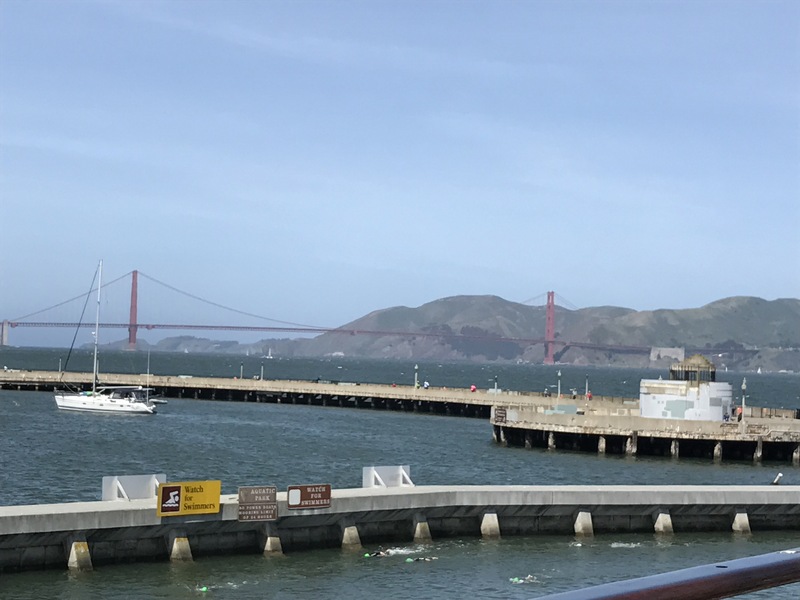 Today, a lovely, if brisk, sunny day on the San Francisco waterfront. Sheila and I decided to visit Fisherman’s Wharf. We hopped on the nearby Powell Street cable car and rode it to the end of the line. That put us at the national park end of the harbour where we were able to explore the historic tall ships – admission free today. 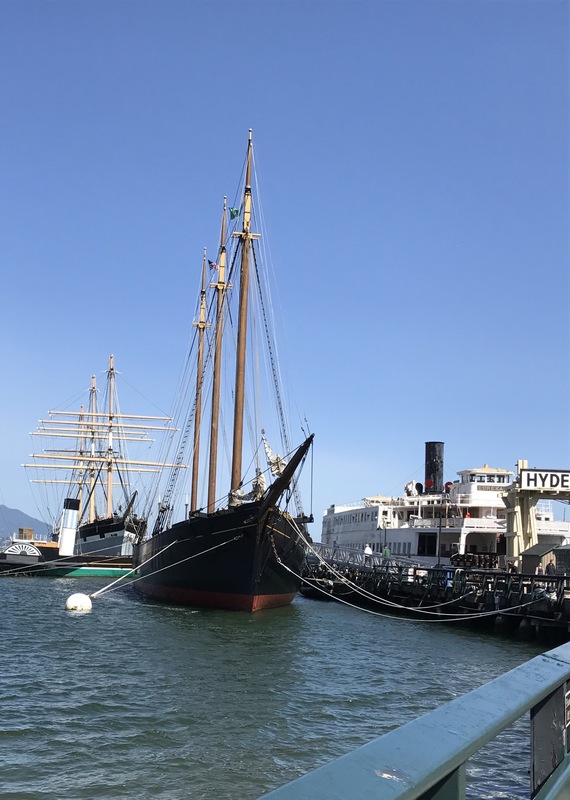 The ships are well kept (although not likely seaworthy) – park rangers were available to answer questions. We chose to mosey about on our own rather than take a guided tour. I preferred looking around at my own pace. 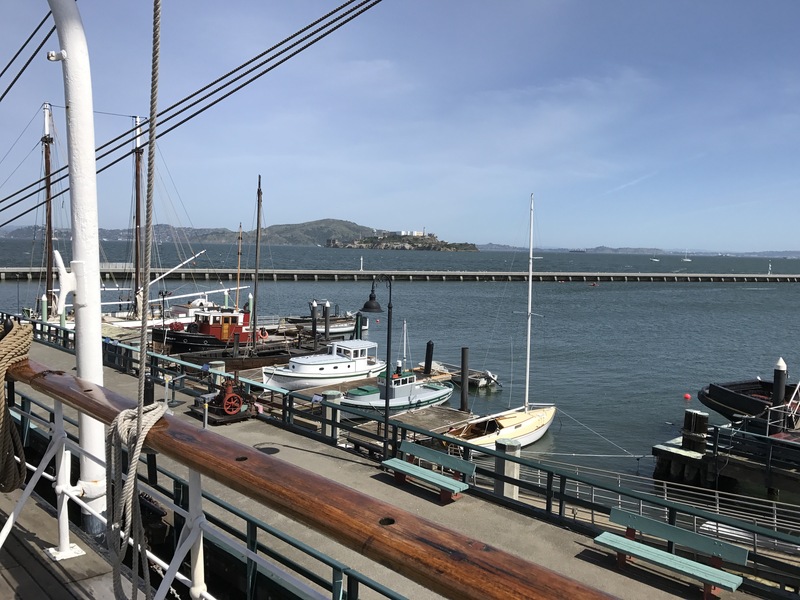 We had a great view of the Golden Gate Bridge from the tall ship decks. We were also afforded a view of the hardy Sunday morning swimmers who entered the cold bay waters at the Aquarium beach, swam out to the breakwater, along the inner side to the open sea end, then back again. We could identify the various clubs by the color of their bathing caps and their swimming gear (one group were wearing wetsuits – smart people!). Seals and Sea Lions were enjoying the day as well. A group of four had taken ownership of the deck of one of the exhibit fishing boats. 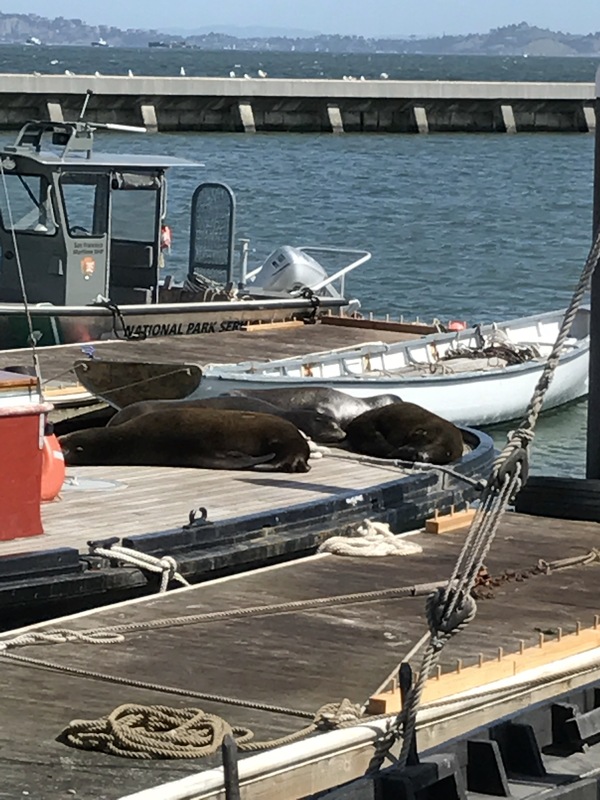 Quite likely the park rangers will evict them at some point during the day, a ranger informed us, because at 450 lbs each they pose a risk to the boat! After viewing the ships we walked our way down the waterfront to Pier 39 at the other end of the waterfront but there wasn’t much interesting to see except for a couple of art galleries which we dropped into on our way back. Both were showing the work by contemporary artists in a wide range of media, some of it expensive. Fun to look at. We caught a cable car back to Powell and Sutter where we got off. The block back to the hotel along Sutter from Powell to Mason is a challenging uphill climb. Along the way we came across this pair of abandoned shoes! 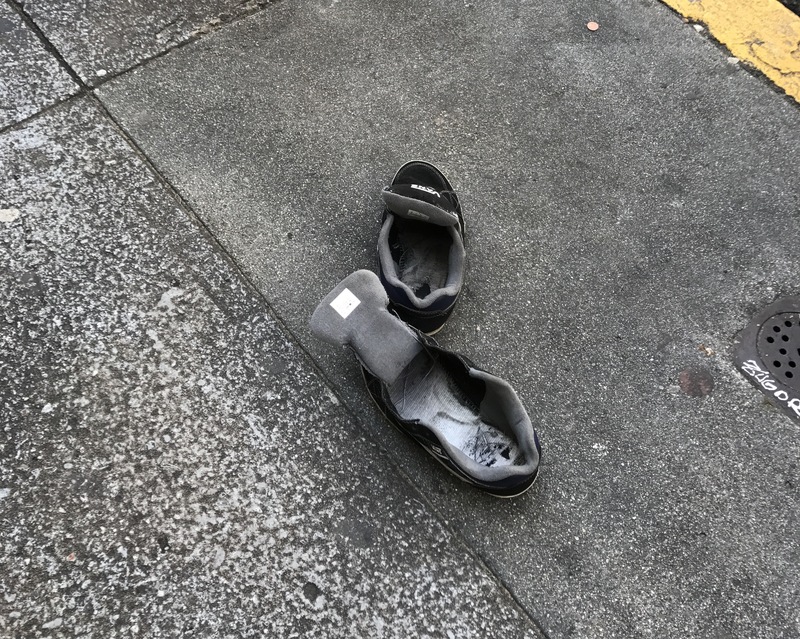 Apparently a guy placed them on the sidewalk then went on his way – for the next needy homeless person perhaps. The week-long sewing retreat begins this evening. We’ll get set up tonight and be ready to roll in the morning. Pants, shirts… I’ve got both on my “to do” list. 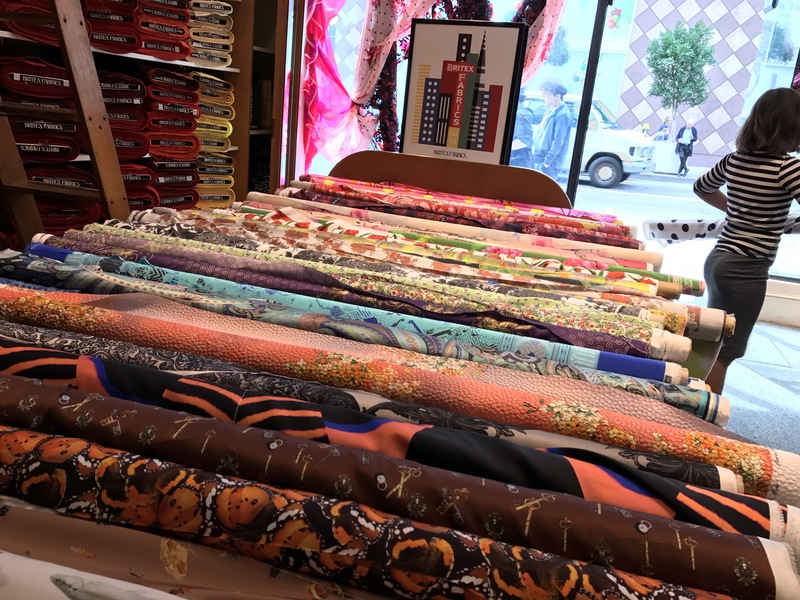 The highlight of today’s trek into the Union Square district of downtown SF was our stop at Britex Fabrics. 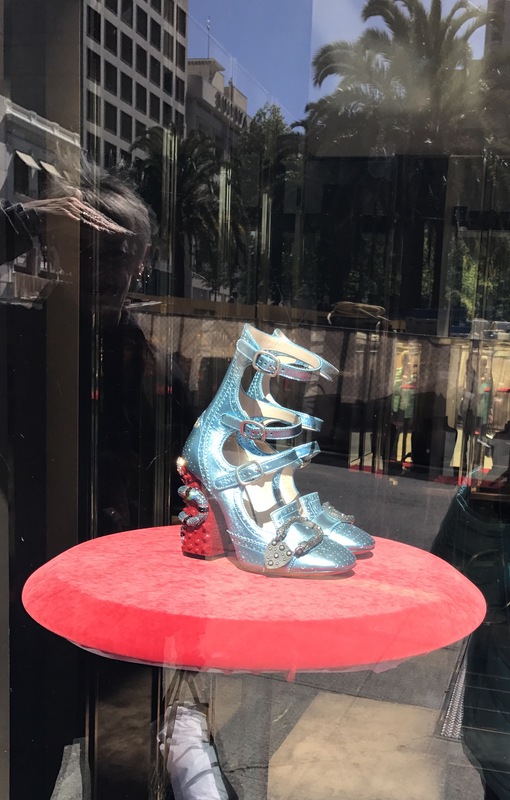 But before I get to that I’ll mention we had a leisurely Saturday breakfast, wandered over to Post Street so Sheila could stop into DSW to peruse the shoes. She did pick up a pair of Bob’s (made by Sketchers) flats. I just shmoozed. Second stop, the Apple Store where I bought an “old” style set of Apple earbuds. Sheila got help with several questions she had about her iPhone, then we moved on. Third stop: Ice Breaker – they make clothing out of a wonderful merino fabric (a very light wool knit) great to wear both winter and summer! However their women’s styles don’t work for me so although I tried on several different long sleeved T-shirts they all looked awful – I bought nothing (Sheila bought a couple of loose pieces). Across the street we visited Gumps – the clothing and accessories are quite lovely but buying clothes there is like coals to Newcastle! Around the corner and back up Geary we stopped at Britex! 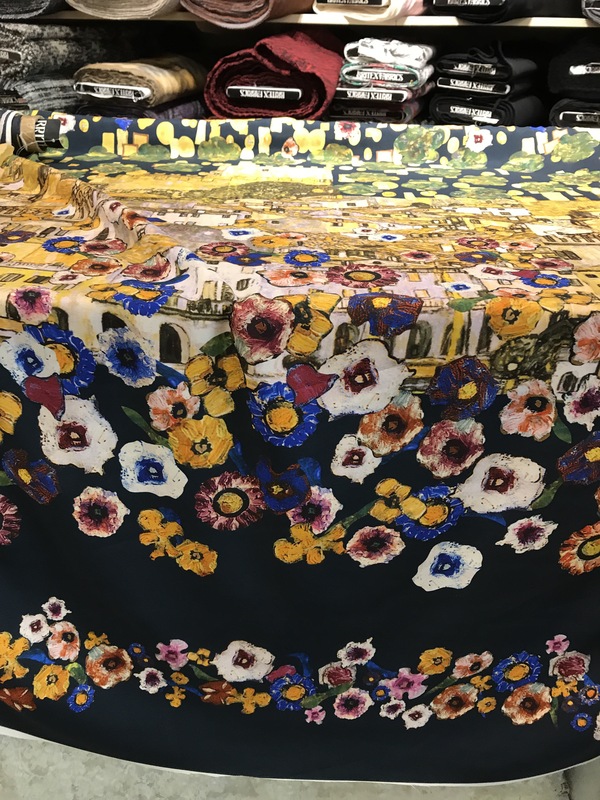 I bought a length of Liberty print cotton to make a shirt. Sheila also purchased some fabric. Exhausted, we headed back toward our hotel, stopping for a latish lunch and a well deserved rest. Next is Happy Hour, then a light dinner and we’ve bought theatre tickets to see a play that’s happening in the theatre here at the Marine’s Memorial Club. Tomorrow, more sightseeing before the sewing group meets early in the evening and our week-long sewing retreat gets underway. The day began early because both Sheila (from Toronto) and I were awake early – just the way it is when you come from so far east. Had a leisurely breakfast then headed out to shop – well window shop mostly. 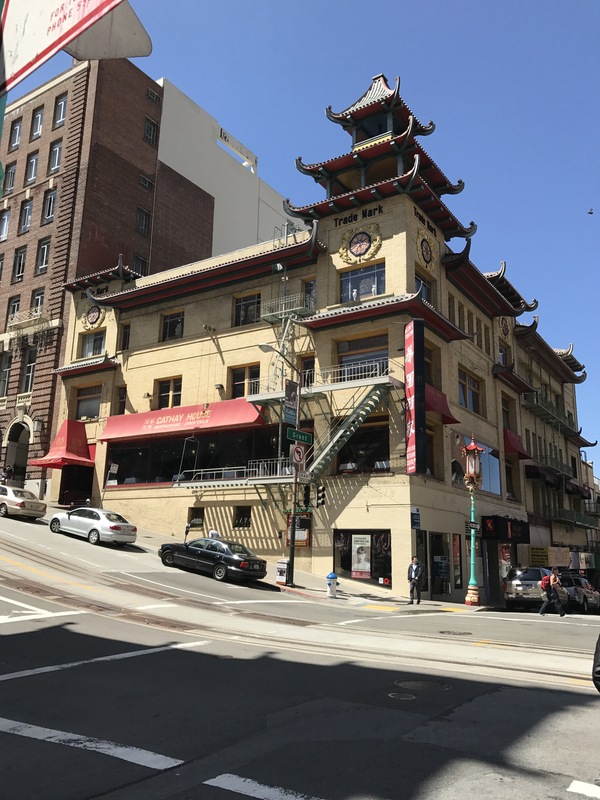 We left the hotel on Sutter Street, turned right at the Mason Street corner, walked a block, turned left onto Geary and walked a block to Union Square. At the square we turned right onto Powell – the Sketchers store our destination but we were still 15 minutes early for store opening so we sauntered further down the street to see what else there was to see. Just as we appoached the UniGlo store at 9:17am the power in all of central SF went out! We didn’t know that immediately. But the shops didn’t open at 9:30. We wandered the Union Square area some more. Thought maybe we might take a street car to the Fisherman’s Wharf district when a conductor told us everything was closed there, too. So we slowly walked back to our hotel – the emergency lights were on but the elevators weren’t working. We climbed to the second floor to use a washroom, then I SLOWLY climbed to our seventh floor room, exchanged my wool sweater and turtleneck for a lightweight T-shirt and returned to the second floor. By this time we knew about a large fire somewhere downtown and also knew it would be a while before power would be restored so we relaxed, as others slowly joined us on the mezzanine. Although we’d had a solid breakfast, we both started feeling hungry – that’s when we realized it was going to be difficult to find something to eat – all restaurants would be closed! However as luck would have it, the Italian restaurant on the corner of the hotel building was trying to organize sandwiches. So we went in and ate, figuring it might still be a while before we’d get anything else. 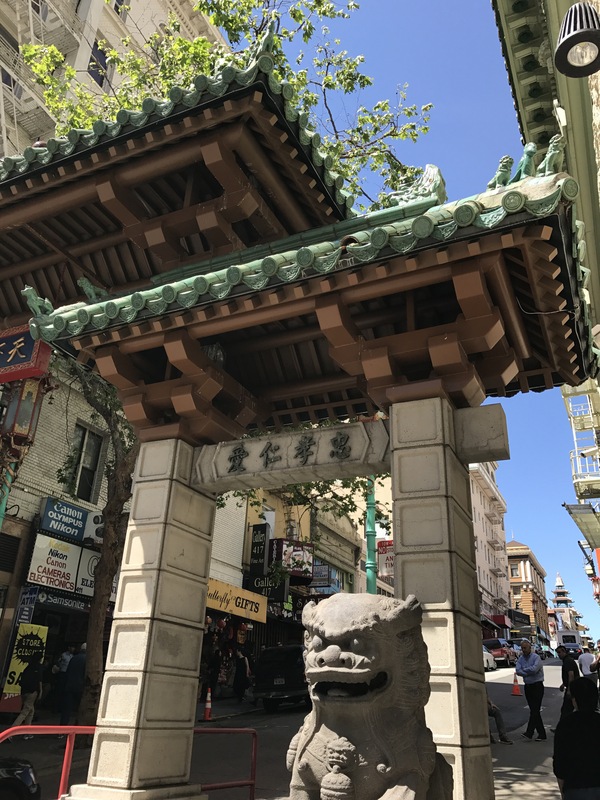 After lunch we moseyed toward Chinatown where most of the shops were “open” – the doors were open with their usual wares displayed on the street – but the rest of the shops were in darkness – cash transactions only. Just as we were approaching the hotel after spending time in Chinatown the traffic lights came on. Power was back on in the hotel – but no elevators. We waited until one of the elevators would operate on manual mode and one of the staff took us to the 7th floor. It was close to 4:00 pm so we went to “happy hour” in the hotel to relax, then decided to try the streets once again. We washed our faces, and set off to see if anything had opened – our first stop – the Sketchers store. We spent a lot of time there, finally each choosing one pair of shoes. Then back to UniGlo, and finally back to the hotel, stopping for sushi before calling it a day. Finished this pair last evening. I enjoyed knitting this yarn – an interesting pattern that moved along quickly. 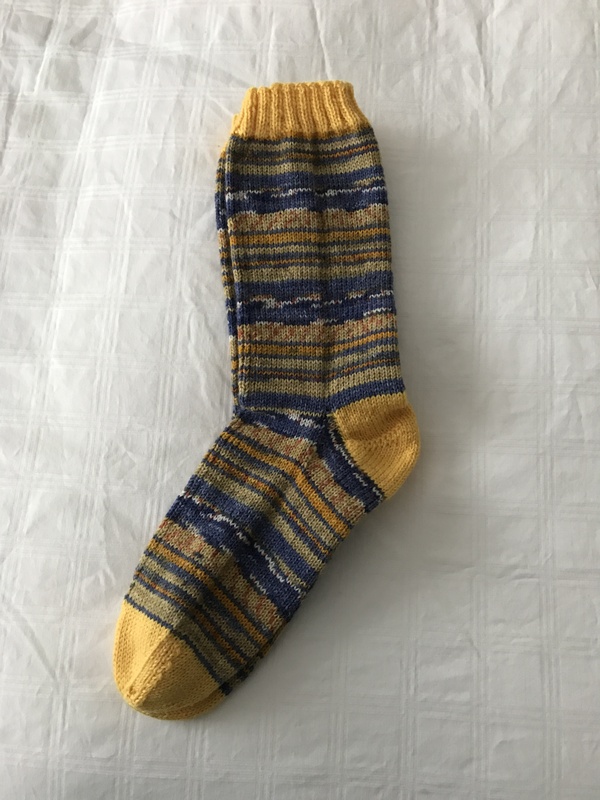 The yellow contrasting yarn is such a sunny colour – it brightened up the variegated blue/yellow making the sock feel happy.